Recently, we treated a 68-year-old woman with an incidentally discovered large dumbbell aneurysm located on the left A1 segment (Fig 1A, -B) with a PED. Because the first PED that was placed shortened more than we expected, it did not completely cover the neck of the aneurysm, and a second PED was placed telescopically with overlap on the aneurysm neck only and with some protrusion in the middle cerebral artery (Fig 1C). Immediately after the procedure, the patient appeared apathetic and hemiparetic on the right side. MR diffusion imaging showed infarction in the left basal ganglia in the territories of the lenticulostriate arteries arising from the A1 segment (Fig 1D, -E). In the following days, the hemiparesis gradually resolved, but cognition remained severely impaired with loss of initiative and attention, slowness and lack of spontaneity, and global memory dysfunction. 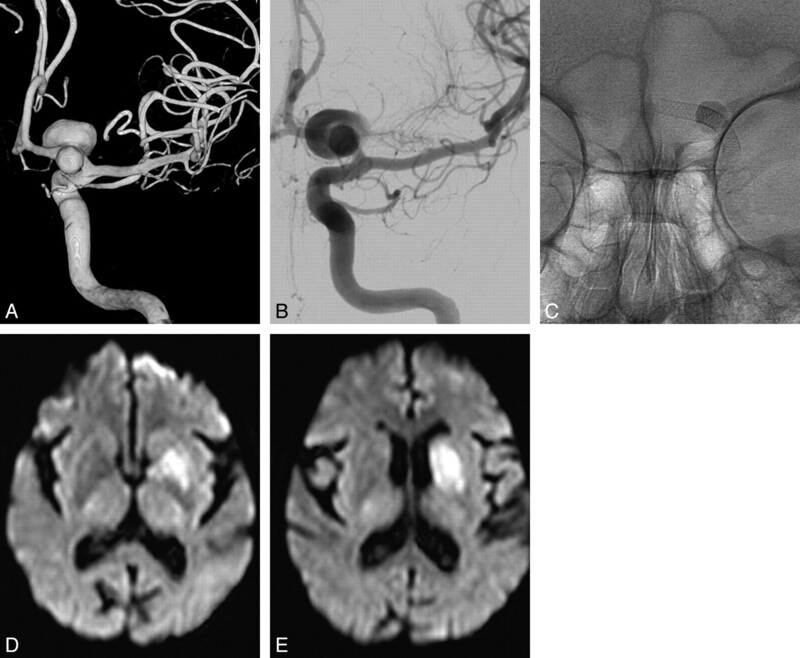 A 68-year-old woman with an incidentally discovered aneurysm. A and B, 3D and 2D angiograms show a dumbbell-shaped aneurysm on the left A1 segment. C, Position of 2 telescopically placed Pipeline stents. Note stasis of contrast material inside the aneurysm. D and E, Diffusion-weighted MR images demonstrate basal ganglia infarctions. This case illustrates that perforator arteries may become occluded after placement of a PED over the orifices. The frequency of this complication is not yet known. As in our patient, occlusion of perforator arteries can have serious clinical consequences. This risk of perforator occlusion should be carefully balanced against the possible benefits of the PED, especially in patients with unruptured aneurysms, the main target group of PED. Many unruptured aneurysms can be treated with other techniques, both endovascular and surgical. As for now, the best indication for the PED seems fusiform aneurysms without apparent side branches or perforators.